Two one-act comedies, written by two of my favorite playwrights, covering the topic of theater criticism? I'm in! While I don't consider myself a "critic" I do spend a considerable amount of time seeing theater and writing about it. So these two plays that skewer theater critics (and poke a bit of fun at theater in general) are right up my alley! 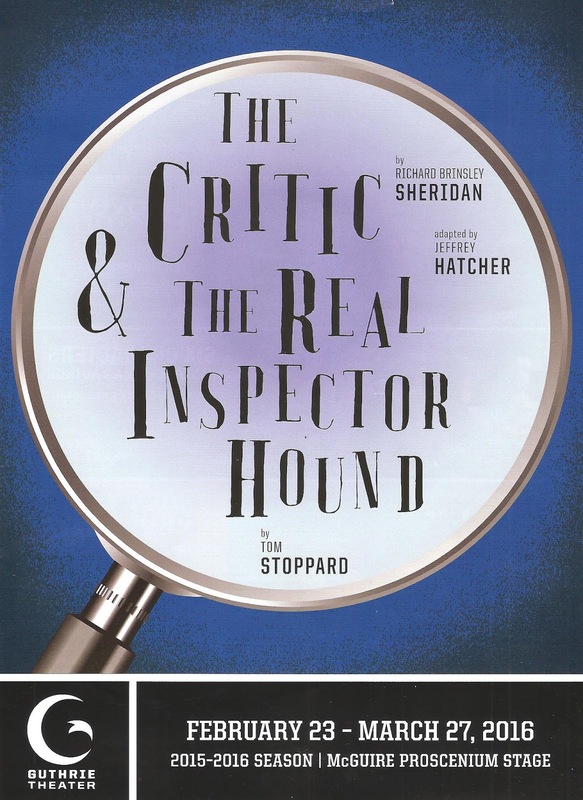 The pairing of Richard Brinsley Sheridan's The Critic (adapted by Minnesota's favorite playwright Jeffrey Hatcher) and Tom Stoppard's The Real Inspector Hound, written 200 years apart, is genius. This fruitful collaboration between the Guthrie and Shakespeare Theatre Company in Washington D.C. features a fantastic cast (that includes actors from both communities) playing in these two very different worlds that both deal with the relationship between theater and theater writing. The result is a hilarious farce, or rather two hilarious farces (or maybe four hilarious farces as both plays feature a play-within-a-play) that is enjoyable for anyone who loves theater. And if you don't love theater, you're in the wrong place. 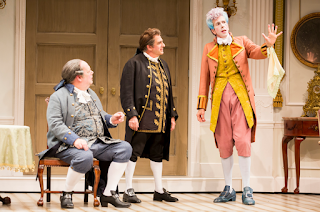 In late 18th Century London, theater critics Mr. Dangle and Mr. Sneer delight in skewering theater and seeing their writing in print. "Critics don't go to the theater to be entertained, they go to the theater to find out what went wrong" (this is precisely why I am not a theater critic, I DO go to be entertained!). In comes the aptly named Mr. Puff, who writes articles about any number of topics, including theater, with the singular goal of promotion. Mr. Puff has decided to write a play, and Mr. Sneer tricks him into performing it while making suggestions for changes from a not-really-there theater owner. The Spanish Armada is every stereotype of bad overblown theater, which makes it a delight to watch. In fairly recent times (the play was written in the '60s), two critics named Moon and Birdboot watch a play, and we get to watch them watch the play. They exhibit very poor audience behavior, eating and talking throughout the show, and even going up on stage during intermission (all of which would get them slammed on social media today). They discuss their lives, jobs, and ambitions as a murder mystery plays out in front of them. In a weird twist, the critics end up a part of the play itself, as the worlds of reality and theater begin to blur. The two worlds are brilliantly woven together in typical Tom Stoppard smart, funny, and clever fashion. The look of the two plays is very different. The Critic is populated with powdered and bewigged caricatures with over-the-top flamboyant costumes, and performances to match. 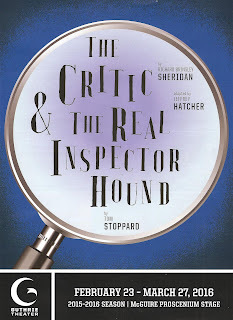 The look of The Real Inspector Hound is more within the realm of reality, as are the performances, at least of the characters outside of the play. Costumes in both plays are colorful and beautifully made (costume design by Murell Horton), and the sets (with a quick change in the middle of Act One) appropriately frame the two different stories (scenic design by James Noone). Under director Michael Kahn (Artistic Director of Shakespeare Theater Company), all eight actors fully commit to the tone of both pieces - high camp in the first act, slightly more realistic but still overly exaggerated "theater" acting in the second. 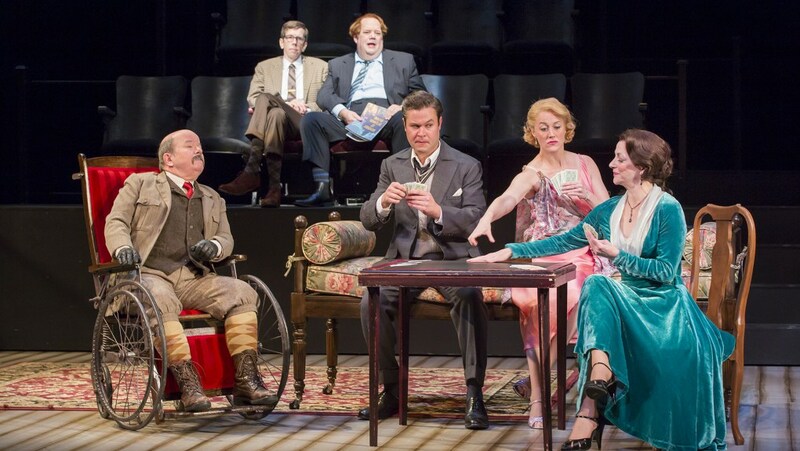 They are all obviously having a great time playing multiple characters across plays, and the audience has a great time watching them. Fantastic performances are turned in by locals (John Catron, Robert Dorfman, Charity Jones, and Sandra Struthers) and imports (John Ahlin, Naomi Jacobson, Hugh Ness, and Robert Stanton) alike. Of note is that all of the critics in both plays are men. You could chalk that up to the period in which they were written, except that that's still largely the case today right here in Minneapolis/St. Paul. Theater reviewer Sophie Kerman recently wrote an article on Minnesota Playlist about the astute observation that most theater critics are male and most theater bloggers are female. While theater writing doesn't seem to have changed much in the 200 years between when these two plays were written, it has changed much even in the last ten years. Printed newspapers are falling by the wayside as more and more people get their news of all kinds from the internet. When I started Cherry and Spoon five and a half years ago, I couldn't find one other blog that was dedicated to Minnesota theater. Since then there's been an explosion of theater bloggers as more and more people find a place to share their voice online, leading to a larger and more diverse conversation about theater than in the old days of one or two big critics in town calling all the shots. The newly founded group Twin Cities Theater Bloggers, of which I am proud to be a part, includes 11 blogs where you can find differing opinions on just about every show in town. These two one-act plays combine to form a clever, funny, well-written, well-acted, highly entertaining evening of theater about the thing that I (and likely many of you reading this blog) love best - theater itself (continuing through March 27).